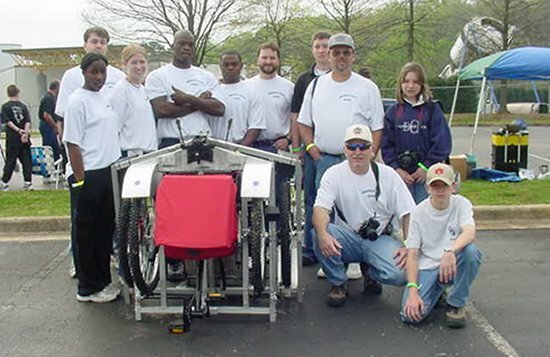 Well, after a year of buildup, the 2009 Great Moonbuggy Race is finally over. After an eventful and dramatic two days of racing, it was time to pack up the buggy and team and head back home. Not before handing out some Canadian souvenirs though! On Sunday morning Raakesh decided to sacrifice his case of Molson Canadian beer to give as gifts to some of the other international teams at the competition. We dropped off some bottles for the German and Indian teams and snapped some pictures with them before starting the long trip home. Twenty-one hours later, we finally pulled into Carleton at 9 a.m. on Monday morning, April 6. I didn’t think it would be possible to experience such an array of weather in such a small time period, but I guess that’s what happens when you drive across half a continent! On the way down to Alabama we turned on the radio to hear tornado warnings and half an hour later experienced torrential rains. Then we had beautiful weather during the races — only to return home to Ottawa with fresh snow and wintery weather! Once we were home, it was back to studying and regular school activities — like watching ourselves on Discovery Channel’s “The Daily Planet!” It was fun to see the 10-minute compilation of three days of filming, though we all had a feeling there would be a lot of footage of the “finger incident” — which turned out to be correct. Re: the “finger incident” — Lindsay’s fellow driver Chris Polowick suffered the most noteworthy injury of this year’s GMBR. When his chain slipped during the first day of racing, Chris put a hand down to try to get it back into place — and inadvertently put a finger into his sprocket. Even with his glove on, he was cut deeply. But after a quick visit to the ER, some stitches — and, we’re guessing, a little good-natured ribbing from his teammates and competitors — Chris was right back in the buggy with Lindsay on Day 2, battling it out. What a trooper! Also on the agenda, now that this year’s moonbuggy race was over, was figuring out who would take over for next year. Because the moonbuggy team is a project within the Carleton SEDS (Saturday Engineering and Design Sessions) club, Curtis and Brian decided to include the moonbuggy leader positions with the CuSEDS annual election. 2009 course knocked last year’s third-place victors down to 17th place. On April 7, we had a big electoral meeting of the CuSEDS group and the new execs were elected for next year. 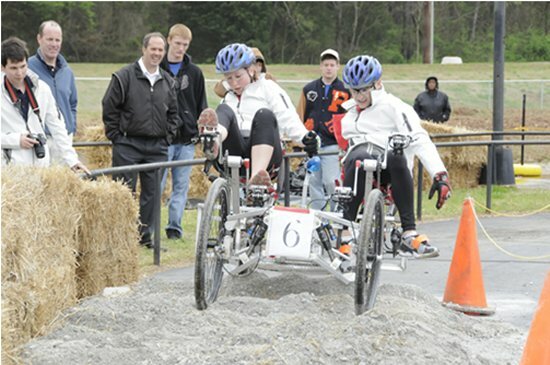 It turned out all the executive positions were filled by this year’s moonbuggy team members — good job, team! The actual moonbuggy project positions, however, are still in the process of being decided. Because leading the moonbuggy team is such a big job, we agreed that it would be better for Curtis and Brian to interview the candidates one on one. So I guess you’ll have to wait til next year to find out! After a quite short night of four hours, getting up at 6:45 a.m. seems to be very hard. And actually it is. I spend too much time in bathroom so breakfast I miss out a little bit. We went to the Huntsville Center for Technology like the days before. There we get a truck for our moonbuggy to be brought to the Space & Rocket Center. At 9 a.m. we do all the registration for the race and check out our pit. Some teams had already brought their buggy there. We feel watched every step we take. But we had to go on. 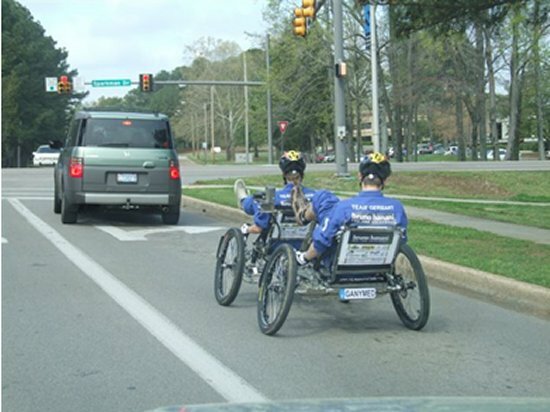 The Moonbuggy has to be driven to the University of Alabama in Huntsville — which is just some feet away over the highway. To give our pilots a break, Christian and I take this challenge. I have to say it is a little bit alarming to drive just between all these fast-going cars on the highway! We have to be careful with steering and speed to avoid any accident. But it is a really exhausting workout. Our chase car made it safety, driven by Ralf. 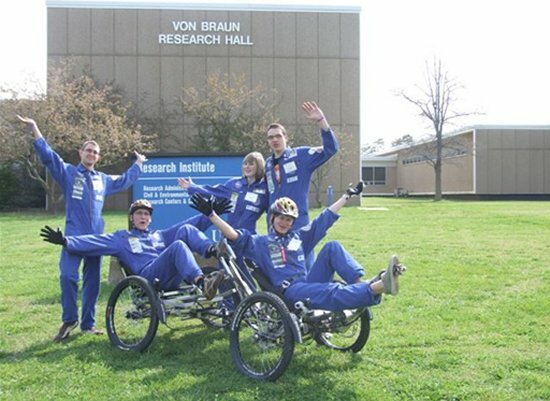 So we were happy and proud after reaching the Von Braun Research Hall. We take some pictures in front of the building. Afterward we visited the UAH technological building where the UAH moonbuggy team was. And they could not believe that we pedaled the whole way from Space & Rocket Center up to here! The other way around we are amazed by their construction. Their buggy consists of aluminum, plastic and carbon fiber parts, which makes it very light. Surprisingly they have the same 14-speed-Rohloff gears too. Having a look at their great equipment (the university even has a helicopter!) we take ride on their training course. Lisa and Thommy have some problems to get over the obstacles. Although racing conditions are harder than in the real race they get along with it. Then we met Suzanne at the office to talk about internships at UAH. We eat lunch like real engineers — having a meeting and getting important information on UAH. We ask if it is possible to do an student exchange. And they really like us to study there for a while. We all get booklets with information on this topic. Dr. Benfield and Dr. Turner show us the IPT class. This is a special project with NASA. The students have to solve a real problem for NASA and their solution will be judged by them after a semester. I am really fascinated by this program. And I definitely will return to Huntsville within the next years to study one or two semesters at UAH and to take part in the IPT class. About 3 p.m. we go to the TV station [Channel 31 in Huntsville] on top of the Monte Sano Mountain. It is quite exciting to see the interior of broadcasting studio. But at the same time it makes you nervous when you realize that you get interviewed and filmed and broadcasted! The anchorman is pretty nice and friendly so our heartbeat slows down a little bit. 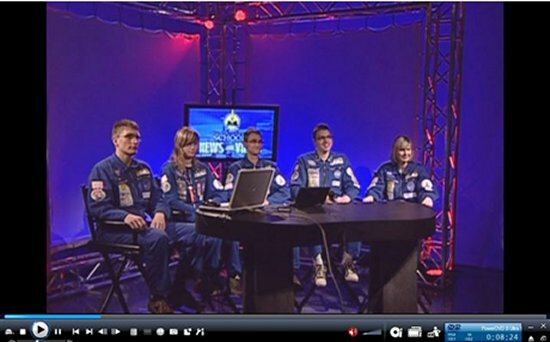 We talk about the moonbuggy race and our journey to America, about ourselves and the Mars 500 project (http://www.imbp.ru/Mars500/Mars500-e.html). The time in studio passes like nothing, and soon it is time to move on to Space & Rocket Center again. At 5 p.m. the opening ceremony starts. A long chain of speeches were given. Even though we are tired it was quite interesting and motivating. The donators remind us how important it is to work in a team and to put your hopes and dreams into practice. Half an hour before leaving we get an tornado warning so we have to stay inside of the building. We watch a movie about the history of rocket development beginning with Wernher von Braun up to the latest inventions of the Ares Program. It is quite interesting although we have learned a lot of it at our Institute. After the tornado all-clear we spoke with the Chief of Northrop Grumman. He spoke German and was very nice to see if he can invite us to an internship. Then we try to get back to the motel as fast as possible. Dinner we eat at Dreamland BBQ which we get recommended at UAH. The evening is filled with writing reports. Our pilots Lisa and Thommy are send to bed early so that are fit for tomorrow. We really hope Anne and her teammates get to come to America to continue their studies — and to tackle next year’s race, of course. The team moves ever closer to the top winner’s circle. Will 2010 be their year? This is a treat — the team takes turns recounting Day 1 of the race. Thanks to team member Christian Hein for the translation work. Anne: 5 o’clock in the morning the alarm rings and after the strains of the last days it is hard to get up. However, suddenly I am awake. Today is the big day. Today the construction of our moonbuggy has to show its strength. But first we have to drive it from UAH to the Space & Rocket Center. We arrange the pavilion which Kay gave us and make the last racing preparations. Thommy: That’s our moment. Most of us worked more than four months more or less intensely on the moonbuggy. Some calluses have occurred and there also flowed enough sweat. Lisa and I roll the buggy out of our box. It looks great. Anne: Thommy and Lisa already roll into the direction of the boxing lane. Fabian packs his telemetry suitcase and gets in position. The cameras are prepared and supplied with new batteries. And I try to think of all eventualities to look after Thommy and Lisa the best I can. Christian: Briefly before start, everybody becomes nervous a little bit and wait worriedly for the start signal. Also I wait tensely for it, because I already hold my camera in position since some time to get good pictures of the first driven meters. Thommy: The pressure rises. Lisa’s heartbeat is already on 100. Now the number 15 is called. Now it’s our turn. The first step is the assembling. Thus we have to try a long time, because the umbrella cannot be fixed, nevertheless, the cube rack of 4-foot edge length fits exactly over the buggy. Next challenge: the buggy must be carried over 6 meters. But with the necessary adrenalin, the 200 lbs of the moonbuggy can be lifted fairly easy. Last point: the disassembling. We make it in very good 6.6 seconds. Then we go to the start line. The tension rises extensively. Lisa and I start to dither because of the low temperature and the excitement. Once more everything is checked through by the voluntary assistants. Anne: Everybody is on board. The buggy stands at the start line and waits only for the signal. The tension is hardly endurable. And suddenly there seems to be a problem. Fabian: The telemetry case works well. Data comes in, files are logged. TEAM GERMANY! That’s us. Suddenly there was no more data. Nothing is working. It’s getting hectic. But in the last seconds Ralf fixes the problems of the telemetry of the buggy. Thommy: Then everything happens quite fast. A volunteer gives us a sign, counts down and the signal sounded. Lisa and I give everything. Surprisingly the first three obstacles are taken very fast. Lisa does a great job. After all reflection about the distance, the driving behavior and the fitness of the drivers I am calmed that she begins that easily and calmly. Christian: Now I have to run, run and again run. Every time I have taken photos in a position, I start to run to overtake the buggy, to position myself anew and to shoot other pictures. If one has a look at the results, it is completely worth this strain. Fabian: Nothing keeps me near the telemetry case. I run to the course to encourage our team. They pass quickly. After some time they return to my position. They push very hard and give everything they are able to do. Anne: I run more or less the whole distance beside the moonbuggy. Now all the strain of the last days and the last preparations discharges in eager calls of encouragement. I am really proud of our drivers and our whole team. Thommy: It does not work perfectly, but with the calls of our team we struggle through the course and reach the target after 4min 20sec. Completely exhausted I try to take breath again. Just now I notice that my thighs burn like fire. Happily we hug each other and I can fade out everything around myself. For me, there were no reporters, no photographers and no other people. It’s only this moment which counts and for which me and my team worked so hard. The feeling of having taken this challenge is extraordinary. I’m so proud of us — nobody will ever be able to take us this moment. Fabian: In the target the clock stops at 4:20. Fortunately, we get no penalties. Nothing is broken, no unnecessary penalties for the racing time. Both drivers have made a good job. Anne: It is simply miraculous. Other words can hardly be found to describe this moment. We rejoice and embrace. Now the race time doesn’t count. We have made it. I distribute water and warm clothes and we slowly return to our pit, still absolutely in a mess, chock-full with adrenalin and the experiences of the running. Christian: The rest of the day goes on in very quiet and regular way. We take our lunch in two groups, because our pit should be unattended at no time, if the jury comes along to judge our award application and our team. While we guard our pit, many very interested moonbuggy race participants come to us. We often explain our technology and where we come from. That’s good practice, because today TV people stand unexpectedly in front of us. I pass this interview better than yesterday’s. Also the VIPs are interested in our Moonbuggy, So I was able to introduce the design of my differential to Prof. von Puttkammer as well as Philip Coker from Northrop Grumman. Fabian: Hopefully tomorrow the race will be as well as today and the weather will be fine, because the drivers have more performance if it is not too warm. Both pilots agree: Tomorrow we want to have a better than 5th place finish! Anne: The day was so mind-blowing that now no reasonable end occurs to me. I can only say: It was great. Tomorrow we will be even better. And I am proud to be allowed to be here. Anne: And again the night is too short. Our report writers worked long until the early morning. I am tired. As so are the drivers. But this is not important now — it is the second racing day. Today we want to make everything better. Quickly we take breakfast and again we are on the way. 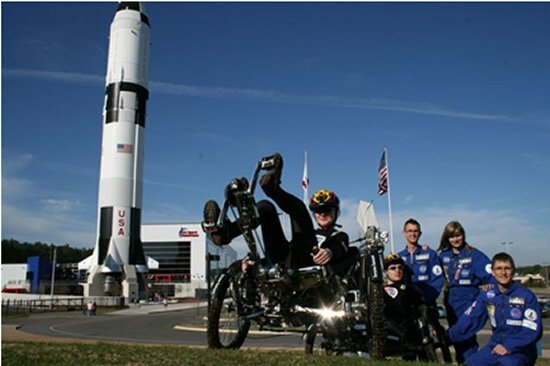 As yesterday Christian and I drive the Moonbuggy from the University of Alabama in Huntsville to the Space & Rocket center. Fabian: There is already a lot of action on the ground. A little hectic rush arises. Lisa learns that we race today in a different order — we have to start much earlier today. For that we were not prepared. It is based on the placements of yesterday; for this reason we have to race fifth! I take the control case and go under the pavilion where our “Mission Control center” is situated. The suitcase is ready to receive data. But nothing comes. The buggy rolls already to the start line. So I cry, “I don’t receive data!” Ralf lays down again under the buggy and finds a loose plug with one look. Shortly before we start, everything is okay and I can record. As yesterday, everything runs with the telemetry smoothly. Lisa: In the whole hectic rush we forget start number, telemetry suitcases and gloves. Because coming late is penalized, we go as quickly as possibly to the start. The tension increases. Once again everything is inspected and checked by the official. Everything is getting so fast that I forget even the stage fright. Anne: Before the start, there is no time for thinking. I do not have time to be nervous, so quickly is our buggy at the start line. However our drivers are determined — today is supposed to be better than yesterday. I can not do anything except cheer. Lisa: Then the start signal sounds. With full power we start our round. The first obstacle comes in a hard way and with full impact. Ralf is taking photos and jumps back. Anne runs screaming next to us. The first three obstacles are so quickly overcome that the first mean-time is near 25 seconds. Now comes the difficult part of the course, and also today it does not run perfectly. The fifth obstacle gives us problems again. Also Thommy slips once again his right click pedal. In spite of that, the second mean-time is good — 1:25 minutes. Thommy: We lie well in the time. It is to be hoped it remains like this. Lisa operates the buggy today still more perfectly and more exactly than yesterday; in spite of that the crater round around the moon lander is the purest act of strength. Anne: I am up to the Saturn I, screaming and running next to the buggy. Now it goes into the crater round. I wait. From my position I can not see anything. Where are they? I stand excited behind the barrier. And at last they come. Thommy: Then at the 13th obstacle it happens. Since the obstacle is quite closely marked out, we slide during the crossing from the gravel obliquely and we ram a pylon. It is not allowed to touch markers on the way. It is clear to us that it will not go without consequences. Now it becomes a torture. Under the pushing of our team we get it over the hilltop and with full speed it goes downhill toward the finish. Our problem curve of yesterday — under the nose of the Shuttle — Lisa takes today without problems, so we overcome the lunar dust obstacle with a lot of speed. In the last two obstacles we are shaken once again tidily. Then it is finished. We cross the finish line and I look at the timer. 4:20. Manure!! All the pains are covered by a new feeling — disappointment over not having improved the time of yesterday. Lisa: Our buggy arrived at the limit of performance. More is simply not possible with a weight from approx 105 pounds. My legs hurt. However, to have gone the course once again without mistakes and problems is a small comfort. All parts held; now it must be analyzed where we can slim down the buggy. We can be proud, because we have the best time of all German teams in three years. Nevertheless, not to have received the victory is a little sad. The way up to there is more difficult than I had imagined at the beginning. Fabian: The time is unfortunately almost the same as yesterday. Lisa and Thommy are angry a little bit in spite of the result. But from another perspective, it is the first time that the buggy went through the course well on both days and nothing has broken down. Also the telemetry and the on-board cam ran perfectly! The data is immense and will deliver a much more precise analysis. Thommy: Through the continuous development of all our teams the results from year to year have become increasingly better. Our present time is better even compared to the university division — there, we would have had the 2nd place! Fabian: We begin now to disassemble the buggy. All parts are packed again and put in the suitcases. We decided to finish this process today so that we have tomorrow free. We want to visit the brandy shop in Lynchburg, where Jack Daniels whiskey is manufactured. After that, we went for a short refreshment in the hotel again, then drive back to the Space & Rocket Center by 4 o’clock for the awards. Because the awarding starts at 5 o’clock, we begin to write our daily reports. Slowly the hall fills up. Seventy-five teams meet. You feel like in a beehive. Will we get a prize? With a 7th place, this is hardly to be expected. However, we quiet because it starts. One fabulous speech follows the next. Every one is inspiring in its own way. However, one speech pricks at me this evening. It is by Frank Six, the responsible NASA man for the moonbuggy race. [Note: Frank is our university affairs officer and a chief spokesperson for the race; he’s also one of the original course designers.] He reminds us of the journey we made and of everyone who helped us. He tells us the journey they made for us to come here. It is all about the challenge we have taken — a challenge of learning how to rely on each other, of sharing responsibility and of solving the problems which stood in our way. But it is not only hard work, he said. We enjoyed the engineering, and meeting other people sharing these interests is even better. And we gained a lot of experience for life. But, he said, we have not done this alone. The were many people who helped us. And we are deeply grateful. Now the future of the space travel is in our hands. He speaks of dreams that we can make become true, of an enthusiasm that was never as great as it is today, and of worlds waiting to be discovered by us. At the foundation of all this is the moonbuggy race, and the many students here. Frank speaks, his voice filled with pride because he sees this vision becoming true here and now. His voice vibrates. Tears roll on his cheeks. The full hall is moved and surprised. I feel proud, and somehow also internally engaged. As Frank’s speech ends, all get up and clap, cheering. Then the awards are assigned. The tension increases with every award given to another team. And suddenly the number 15 is read out as winners! “German Space Education Institute!” We won an award! I can not understand it; yet there we are already shiningly on the stage and we get a blue plaque that reads MOST IMPROVED AWARD. We improved our time from the previous year; it was around 6 minutes — the greatest improvement among all teams. In an overjoyed way we sit down on our places. However, the next surprise comes quickly. Dr. von Puttkammer steps on the stage and gives a speech about international cooperation. At the end, he announces the German Space Education Institute gets the prize for “Best International Team!” All the strain of the last days, weeks, months falls now from us. And I must confess that there are tears in my eyes. We celebrate our success with Dr. von Puttkammer afterward at Huntsville’s rich-in-tradition Mexican restaurant “El Palacio.” Then, let out, we end the day. The path we took was not easy. However, we have done it. We won two awards today, and that is more than I had hoped ever to dream. We made many international contacts and close friendships, won experiences and learned how to get around difficult situations. I must say it was all worthwhile. I would like to say thanks to a few important people, and I think I speak on behalf of the whole team. First I would like to thank Yvonne and Ralf, without whom none of us would have come as far as we did. Indeed it is not always easy but it is worth it to go the difficult way. Then to our parents, who always support us in everything and help us in difficult situations. Especially I would like to thank Thorsten, who is an attendant, helping hand and particularly a friend to us. Of course our sponsors must not be missed here — without them our journey would not have happened. Also to all the ones working quietly in the background, who cleared some heavy stones away for us, I would like to thank you. And to my team, which persisted on the journey overwhelmingly. Many thanks to you all. You created this — from actions come vision. 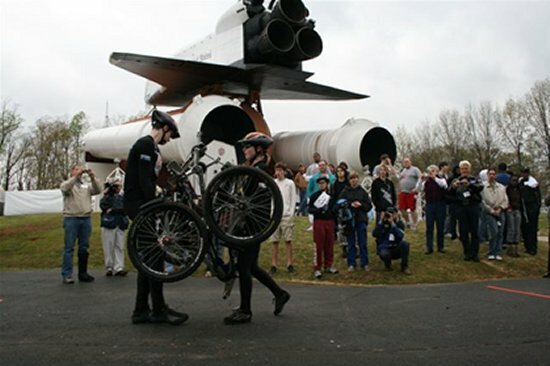 I return to Huntsville for the Great Moonbuggy Race next year for sure. Then, however, I will belong to the university division. And I will study engineering. If you and your teammates stick with engineering, Anne, our future in space — and here at home — grows brighter every day. Thanks for your insight, and have a safe journey home. is Anne Geyer. Standing are Christian Hein, left, and Fabian Hoffman. Team Germany is On the Move! 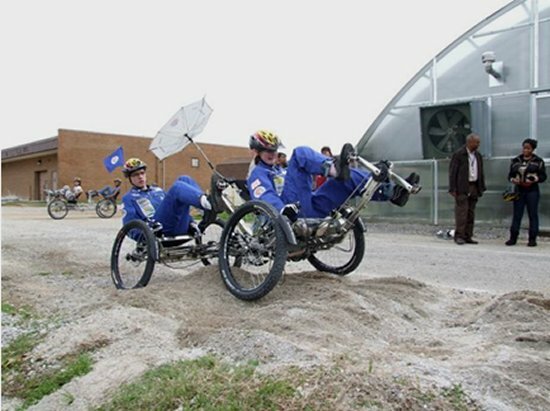 We’re on the course today — NASA’s 16th annual Great Moonbuggy Race is finally upon us! Here’s more pre-race highlights from Anne Geyer and Team Germany. If you’re not yet signed up for real-time race results via Twitter, get on the stick! Visit http://www.twitter.com and click “Follow” on MOONBUGGYRACE to get the latest GMBR news! And again the alarm clock rings earlier as I thought. Like yesterday I get up by 6:45 o’clock and disappear under the shower. After breakfast we should start immediately; however, unexpected problems delay the departure. The e-mail server refuses service. So we have to find another more elegant solution to avoid this problem and maintain correspondence with the home and our American friends. There is also pleasant news. We made it onto the first page of The Huntsville Times! The interest which we have released with the media is huge. It would be nice to see the results of the camera shots. But unfortunately the broadcasting time is unknown to us. By 9 o’clock it is done, so we can start. Before going to the HCT, we insert another short stop to meet one of the Indian teams. They arrived yesterday and are still correspondingly tired. Their moonbuggy is still on the way by ship to America. I can understand that they become slightly nervous. I would be restless too if I did not know that every part is here and that the moonbuggy works right. At the moment we cannot do anything for them, but we offer them our help if it should be needed. At the Huntsville Center for Technology, we head immediately for our garage and make the buggy ready to go. Also today the television enrolls itself. A reporter interviews and films me. I get a microphone so that I can declare the moonbuggy and talk about our team, the journey and the SEI. Although this is not my first interview, I am a little nervous. And sometimes it is not very easy to get particularly the correct English words. And so I am happy when I can give him the microphone back! The teams of HCT and Madison High School train already and want to compare their times with ours. Under competition conditions, we practice folding out the moonbuggy [for the timed assembly]. In this case we are, at 9 seconds, not far away from the best time of 6 seconds. However, we agreed to ourselves that with some more practice we can even be better. Then the buggy goes onto the test track. Two rounds [matching the length and conditions] of the race are to be driven. However according to the first round we interrupt because it begins to rain. Unfortunately the times are not comparable because of this. Our best 3 minutes 54 seconds, which is in fact very fast. All buggies have gone back into the garages a second test run is scheduled for after lunch. The test run showed one problem clearly. The rear-wheel brake is too heavy for Lisa to move. And so we begin to search for possible solutions. We decide on extending the brake arm for better leverage. It is our hope to find the suitable tools and materials here. When we explain the problem to Dmitri, the Russian driver of the HCT team, he says there should not be any problem. Christian and I also talk to Mr. White and the teacher for welding and they agree to help. After we find a suitable piece of aluminum and saw it, we weld. In the spare time between, we talk us with Dmitri and the boys that work in the workshop. Jokes are done and we exchange interests. It is amazing already that we get on so well in spite of the differences. After the welding and cooling down, we slur some corners and edges in order to avoid injuries. Then we test the result. The adjustment of the brakes requires a sensitiveness, so it takes a while until both back wheels stop again simultaneously. But nevertheless a test on the street is indispensable. Christian and I accelerate the moonbuggy to full speed and try an emergency stop. We repeat the whole procedure a number of times — however, the result remains the same: The buggy moves to the left while braking. Back to the garage to change the attitudes correspondingly, then a further test, and everything is right. Back again in the garage we are called to go for lunch. Fortunately we have been invited for lunch with the local team. There is a tasty chili con carne and brownies. The secretary of the manager has cooked a giant pot of chili. The mood is loose. All are glad to sit on a dry place and to be able to relax a few minutes. However, when the buggies are barely back on the course, it starts again to drizzle. Lisa and Thommy drive, and in the end both descend quite soaked and with bright red faces. However, their time was substantial — 4 minutes 9 seconds for two rounds. The best team reaches 4 minutes 1 second with a month of training. That’s not bad. Quite satisfied we decided to leave it at this attempt, also because of the hard rain. Lisa and Thommy put on dry clothes and have some time to recover. Christian and I conclude to watch the other teams keep training. And when the rain stops we exchanged moonbuggies. We drive the buggy of the HCT and they get ours. The small round on the court suffices and clarifies the differences of the driving behavior. The guidance and steering are different and the higher sitting position leads to a completely different feeling while driving. Now the load test approaches! Can our buggy move a two-ton truck? First, Ralf fixes the moonbuggy to the vehicle with a rope. I switch into the first gear. Feet on the pedals. Christian gives the signal. Three, two, one — and GO! The tires spin a little but then they grip. Slowly we move ourselves. No problems. To sum it up: we do not need any breakdown service, we have a moonbuggy! Many thanks to Anne, Thommy, Ralf and the whole German team — see you race-side! The energy and efficiency of the German Space Education Institute team never ceases to amaze us. For the last couple days, they’ve been scrambling to get their moonbuggy reassembled after its cross-Atlantic voyage, putting it through its paces to ensure they’re ready for the race this weekend, spending time with fellow racers from around the globe, talking with local media and seeing the sights — and STILL team member Anne Geyer finds time to post some thoughts on the experience for the Buggy Blog! Thanks, Anne! German Space Education Institute team member and blogger Anne Geyer. Today the alarm clock already rings 6:45 o’clock. A hard day approaches. Dress, breakfast and already it starts. 8 o’clock on time we drive onto the ground of the Huntsville Center for Technology. They are already waiting for us. First we greet the director, Mr. Turner, and then we take a short look into the school. We are received as we are used to — very friendly. Tim White, the responsible teacher for the local moonbuggy team, shows us the workshop, which impresses us a lot. Lathes, upright drill presses and mills would be a dream for our garage in Leipzig. 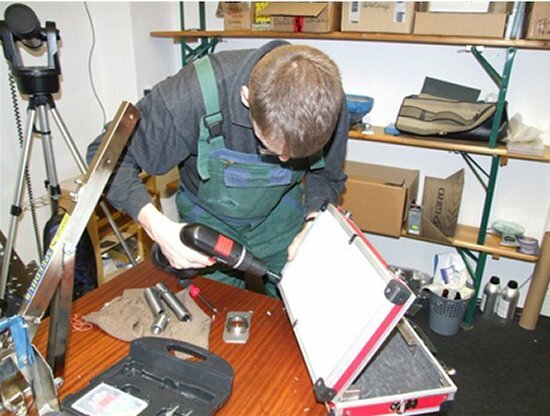 Many things might be finished considerably more quickly and in a simpler way, particularly for small changes to components a lot of work and of course time would be saved. Photos on the walls show their successes of the last years and their own test track. The thoughts of going to race against a team that is so well prepared for the course worries me a little bit — there are already many advantages for the American teams: their own workshops, the support of the schools and the short journey, during which their moonbuggies do not have to be disassembled into pieces. Next we get shown the moonbuggies. Yes it is not only one, there are FOUR. Two are still from the last year and two are driven for this year’s race by four teams. However, when we have a look at the moonbuggies more closely, my doubts are dispelled again. Our moonbuggy can keep up, definitively. It seems to be lighter and more flexible; however, [we won’t know for sure] until the race course itself, because we still lack experience. We do not allow ourselves a lot of time for the comparing, because we want to begin at last. For tomorrow [Tuesday, March, 31] we are invited to a small test race at HCT and then the moonbuggy must go. However, before the assembly — the unpacking. At last the chrome-plated parts lie cleanly and tidily on the workshop floor to be screwed together for our moonbuggy. Separately these parts seem insignificant, but in my head they get together to become a vehicle — one that is more than the sum of its components. All our hopes and dreams enter this work, and we are proud to have created it so far. Christian and I work on the rear axle and attach the sub frame and the S-lead springs in order to mount the seat and the wheels. Lisa gets the seats with the new, freshly printed purchases. Fabian and Thommy work on the front-wheel suspension. The rear axle and the front axle are joined with each other. The basic thing is now created. Only still the front seat with the shock absorbers, some smaller precision adjustments, and the cable harness for the telemetry and the braking lines are missing. At the end, [we determine] whether all nuts are tightened. Then the moonbuggy is ready to start. During the time we put that buggy together, a reporter and photographer of the Huntsville Times comes by. They take stock in our engineering. While declaring the construction, we notice how our enthusiasm is increasing more and more. Christian is explaining the most interesting parts, from the Schlumpf gears and the Rohloff transmission up to the differential, and with every point the astonishment became greater. Even the interior of the differential was examined with manifest astonishment. But now it is done. After endless weekends of long work, and the 24-hour trip to Huntsville and an 5-hour uninterrupted assembling, we roll at last from the garage of the Center of Technology with our moonbuggy. We turn our first round around the ground and all looks follow us. Curiously and skeptically the other teams look to us afterwards. I notice that the steering falls to me more easily today. And we are ready to go over the obstacle, a big gravel heap. The moonbuggy is put to test. At 20 kph, we direct to the obstacle, then everything works very quickly — a jump, a well subdued strike and already we are over the gravel heap. Slowly it starts to be fun, so we take another training round: jump over this and that obstacle, try us in sharp curves or test simply our high speed. Lisa and Thommy brave the test track at the Huntsville Center for Technology. It is 1:30 p.m. when I drive the buggy for the first time on American ground. It is a special feeling. Lisa and I go into the sun and turn first just a small run around the building. This first test run proceeds very satisfactorily. No unexpected noises are heard and the mechanics function wonderfully. The gears work like a Swiss clockwork. We drive back to the garage and discuss the parts to be changed. Then we start onto the test course, which consists of several hills and obstacles. This training proceeds very well. We try out different situations. [We simulate getting stuck in gravel] to see whether we can fight with our gears out of this situation. Our moonbuggy masters this challenge with bravura. Indeed the wheels spin, but with united strengths, Lisa and I manage to drive it off the gravel. It is nice to know that we have a competitive buggy and that the work of the last weeks is quite exact and solid. After long and hard practicing, we return our buggy to the garage at 5 o’clock and prepare it for the training tomorrow. We also visit with a team from India, who arrived today in Huntsville. They do not know yet how to get their buggy onto the wheels. It was transported as a whole and must be repaired now, they say. It’s my idea to go to the Chinese restaurant where we ate very well three years ago. We all freshen up before we sit down in the car again and set off. Unfortunately it turns out that the restaurant is closed on Mondays! So Ralf decides we should go to the El Palacio restaurant in Huntsville to enjoy our dinner there. Presumably deserved, I think! It does not take a long time to be served. We eat our deliciousness from the Mexican kitchen. After that we sit down at our daily reports. I think that every evening should finish like this. We laugh a lot and we are totally happy that the day was successful. I was part of the UAH team in 1995 and 1996, during my last two years as an engineering undergraduate. When the race started in 1994, it was held in the summer, and it had been primarily an engineering design activity for seniors. So in 1995 we had lost all our institutional moonbuggy knowledge — all the previous year’s participants had graduated! I was a junior in 1995, when the race moved to the late April/early May timeframe. We were still racing on the original course here on Redstone Arsenal, on the very site where NASA tested the original lunar rovers in the 1960s. We finished in second place that year. In 1996, I was completing a very tough senior design project and I had a serious case of senioritis, so I really pulled back, tried to minimize my involvement. Then, the last week of classes, literally on Thursday night before the moonbuggy race on Saturday, my engineering classmates and I had a pizza party, and I took leftover pizza out to the team, which was still working on the moonbuggy. I think I got there at around 8:30 p.m. — and I ended up staying to work on the moonbuggy until 3 a.m., then went back first thing the next morning and we worked around the clock, trying to get it ready for the race on Saturday. We didn’t think we were going to make it. It was the first year NASA had held the race at the U.S. Space & Rocket Center. On Saturday morning, the day the colleges and universities raced, there was a tornado warning that delayed the start. Everyone had to go inside, stay in the tornado shelter until they sounded the all-clear. If it weren’t for that delay, we never would have made it to the starting line in time! As it turned out, we came in first place that year. But I don’t recommend waiting til the last minute like we did — boy, were we flying by the seat of our pants in those early years! 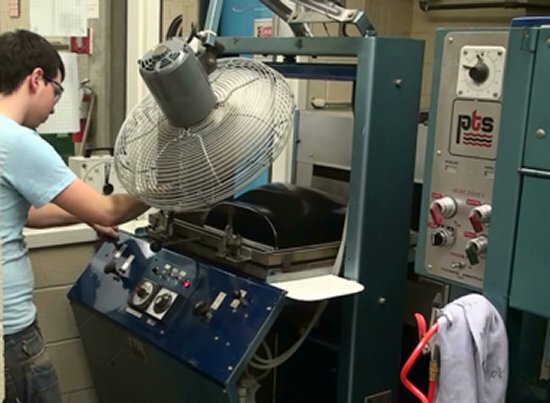 Mike graduated from UAH, and he joined the Marshall Center’s workforce that same summer. He became a moonbuggy race volunteer in 1997, and took on the head scorekeeper job in 2001. He’s been monitoring racers’ times ever since. Why? I like the idea of helping to recruit bright, new minds to come work at NASA. I think the race is incredibly inspirational in that way. Whatever you choose to do with the experience beyond high school and college, it’s a great opportunity, and great fun. It keeps me young. At Last Again in America! 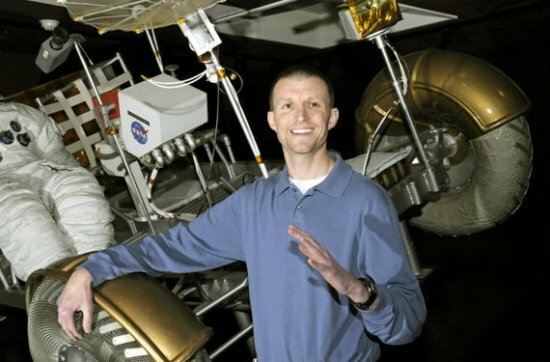 Thommy Knabe, a three-year veteran of NASA’s Great Moonbuggy Race, is the kinematic specialist for the German moonbuggy team, and constructed its first moonbuggy simulator. He and his fellow racers from the German Space Education Institute are enjoying their early arrival in Huntsville for GMBR 2009. He filed this report Monday when he arrived. It is 4 o’clock in the morning, when my alarm clock rings. The night was short. The other ones of my team flew already on Friday to America. I could not, because I had a written examination in physics that was quite important. At 5 o’clock I set off with my suitcase and a part of our moonbuggy with the train to Frankfurt. From there it goes via Cincinnati and Atlanta to Huntsville — a journey of more than 6,000 kilometers [3,728 miles] over the Atlantic Ocean. It’s not only the long travel time of about 24 hours, but also the bureaucratic hurdles, because of entry to USA and the carrying of metal parts for the moonbuggy race. From Frankfurt it goes for nine hours to Cincinnati. There, you enter the U.S.A. and must indicate with the Homeland Security different questions concerning whereabouts and reasons of the journey. An hour later I am again in the airplane to Atlanta. It is a smaller airplane with about 100 seats. My baggage arrived well in Cincinnati and it still had to be given up for the connecting flight. On internal American flights the baggage is guided on to the destination automatically. To this point in the journey, all important parts of the moonbuggy are still there. In Atlanta I have three hours of stay time. The worst thing is that my flight to Huntsville is delayed because of the weather. I am quite tired. Because I slept only two hours last night, I am almost 36 hours awake. As my airplane, again a small one, starts in the direction of Huntsville it’s 23.30 [11:30 p.m.] local time. In Germany it is now 4.30 in the morning next day. Because I fly into a new time zone, when I arrive it is still 23.30. The baggage arrived already before me. Ralf fetched it and waits now for me. We talk a little bit, but I am quite tired. So we go by car to the hotel, where the others already sleep. A hot shower and 10 minutes later I lie in a warm soft bed — still thinking that it is quite crazy to be still in Germany yesterday and now 6,000 kilometers far away in America. I close my eyes. In any case, I am quite glad to have done this challenge alone and without problems. Congrats on making the trip, Thommy! We’ll see you and everyone else at the GMBR opening ceremonies Thursday night. 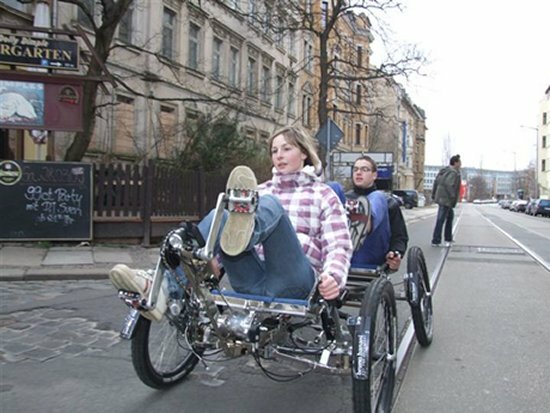 Anne Geyer is a member of the German moonbuggy team. 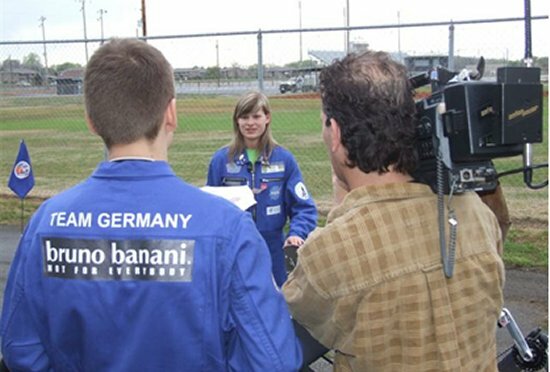 As I write this, she and her fellow racers from the German Space Education Institute are already in Huntsville. They’re doing some pre-race sightseeing — and engaging in some friendly competition with teams from the Huntsville Center for Technology, the Madison County Career Technical Center and fellow early arrivals from the Punjab Engineering College in Chandigarh, India! Here’s Anne’s reminiscences on her trip across the pond (with thanks to translator and fellow team member Thommy Knabe). After packing hours it is at last so far. The Moonbuggy is disassembled, labeled and packed into 12 suitcases. Relief, because it became once again late. However, an important component of our Moonbuggy is still missing. The cable harness for the telemetry must still be soldered. Interested I look over Thorsten’s shoulder, nevertheless in fact I can help him unfortunately not. And so it comes that Lisa and I are ready by 1 o’clock with our work and can still sleep for a few hours. While Ralf and Thorsten go on tirelessly and make the last preparations. However already 3:30 o’clock we have to get up. In the kitchen Yvonne waits for us. She regret that she isn’t able to come with us, because she disassembling a children. Quickly we put on the team T-shirts. Then everything happens very quickly. The suitcases are gotten, a last once weighed and loaded onto the trailer. Also our hand luggage enriches with that or other part. We starts 4:15 o’clock with a little delay. Our first destination is Frankfurt. However, already on the first meters the convoy is stopped. Thorsten, Fabian and Christian get into a routine traffic control. Much more I don’t realize from the journey, because the short night requires their toll and I fall into a deep sleep. Arrived in Frankfurt we have to wait again. Another two and a half hours up to the takeoff. Fabian, Ralf and Thorsten drive the cars and the trailer to a parking place and nevertheless the rest fits onto the baggage. Another one hour up to the takeoff. Impatience spreads. Why do they not return? Now they come running through the check in hall. The time is urgent. And that also the nice ladies at the baggage tasks mean. Everyone gives up two suitcases and sorts his hand luggage. And already it goes on for the security controls. Putting aside everything with metal and getting laptops out of their bags. After nevertheless Fabian had to subject itself to another more precise search, the Boarding can begin. 11:25 o’clock everyone sit on his seat facilitated. Next stop Cincinnati. In the airplane it’s again time to relax. We read, write travel blogs and make Rubber bear- Gang-Partys celebrated. They all can’t Sleep in fact. On the one hand because the excitement and tension onto the imminent time is too large and on the other hand because nevertheless it is not very comfortable to sleep in the airplane. We land after 10 quite uneventful hours 16:40 local time in Cincinnati. And here the whole airport hubbub begins again. Entry control with fingerprint and photo, security gates, baggage fetch, baggage check in and wait again. After we have eat something we mount 20:00 the very small airplane to Huntsville Alabama to the final destination of our journey. The one hour flight goes by quickly. Already we can recognize the Rockets of the U.S. Space & Rocket Center from the air. In the airport hall, Mr. Turner the director of the Huntsville Center for Technology already waits for us. He organized the transportation of the suitcases to his school in which we can build up the buggy again. Monday at 8 o’clock we start. We only take the personal things with us to the motel. The evening fades away with a dinner in Arbys and the happy feeling of being in Huntsville again — this city that formerly was magnet for young constructing engineers and becomes magnet again today through the new space programs. In any case I am very happy to be here and maybe to start my career in the industry of the space exploration here. Tightened onto the next day I close my day report at 23:50. At home it is now 6 o’clock in the morning. A long day ends. Getting up at 8 o’clock. It is easier than I thought after that relative long night. Today we have no time pressure so I can have a longer shower and prepare myself for the day. The breakfast turns out to be a little bit strange for European tastes. We have cornflakes with 0.3% milk and bagels without anything. Around 9 o’clock all are ready and we can set off after a group photo in front of our motel. Ralf shows us the city and tells us a lot about the changes in the last years here have carried out. Huntsville is a typical south states city. With the beginning of the space and rocket time houses and industry settled around the old town center. The first stop of the day is on the rainbow mountain west from Huntsville. Here we visit the Headricks Ralf knows already since his first visit in the USA. Although it’s still relatively early, we are received extremely hospitably and feel well immediately. The conversation goes up to the extraordinary hobbies of the Headricks to our Moonbuggy about Huntsville’s space history and the anecdote of the first meeting with Ralf and Yvonne. Both drive motorcycle passionately with pleasure and own three BMW motorcycles that show it to us fully pride. Very amazing is also, that they made the lead glass windows in their house self. Similarly also the home cinema of the Headricks inspires us. An own room with comfortable armchairs and multimedia equipment. At least we are invited spontaneously to the dinner food with subsequent film for Wednesday, something we very delighted and thank accept. Again in the car we continued our sightseeing tour. Ralf shows us a new shopping center in that we us to decide to eat. That is the bridge street town with exclusive businesses and artificial lakes. Then it goes on through the old town to the Mount Monte Sano. The mountain was settled in the 60s by German members of the von Braun team. Today still descendants of this engineers live there. So drive also to the house of Prof. Dr. von Puttkamer. Ralf can’t tell fast enough, he knows so many anecdotes and histories above this mountain. Suddenly we stop at one small house. Walter Jacobi stands at the name plate. He is one of the last still living engineers of the Paperclip program. 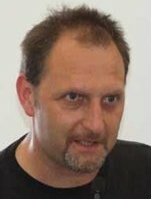 Without knowing whether he has time for us, Ralf rings. Spontaneously we are invited to a coffee. We sit down on the veranda and have many questions. Mr. Jacobi tells us about his work in Huntsville and about events from his life. It’s insanely thrillingly and interestingly to listen to somebody, who formed the beginnings of the space exploration with. But it makes me simultaneous sadly, however, that there are less and less people who can tells us and that the entire knowledge and the experience of this old generation for future generations goes lost. However this that makes this conversation very unique and moving does, because who can say from himself to have talked to one of the founders of the present space exploration. After the cordial discharge we keep on going to the Tennessee River. Hardly there arrived it starts promptly raining and a short thunderstorm moves over the country. However, after short waiting the sky clears up again and the sun shines. We get out and walk onto the shore. The air feels cleanly and smells of rain wonderfully. Because it is already relatively late we can gaze a wonderful sunset. After many photos it goes on to the supermarket in order to enlarge the offer of our breakfast. After that we still go into a small restaurant named Humphreys , where we make the evening finish and wait until Thommy arrives. More to come from the German team and others, including some great photos and some pre-race thoughts from Anne’s teammate Thommy. If you’d like to drop the German team a line, they’re always thrilled to talk GMBR and space education: moonbuggy@spacepass.de. Last week was a particularly exciting one for the moonbuggy team. Curtis Parks, our project manager, got a call from Hilary Bird, a friend of a friend of one of our team members — who turned out to be a journalism student doing a week-long work placement with Ottawa’s CTV news channel. Hilary had been invited to our comedy night — which was a big hit, lots of fun and raised more than $700! — and though she couldn’t attend, she thought our team would make a really great news story! So last Thursday afternoon, Hilary and a CTV cameraman came over to Carleton to get some footage and interviews. Curtis, Chris Polowick and I were interviewed and they got lots of footage of us working on the buggy, rolling it around and building parts in the machine shop. It was all very exciting — but as soon as it was over, we had to start getting things organized for the next day when the Discovery Channel would be sending over a film crew to spend the entire day with us! We took the buggy for a little spin from our team room down to the machine shop, with the film crew running behind, then set to work for the rest of the day. Everything seemed to be a little bit more exciting and intense with the film crew hovering around. They were in on all the action and would stop us every once in a while to capture our work and explanations of what we were doing. After lunch, Curtis and I were taken aside for extensive individual interviews with one of the producers to give a more detailed explanation of exactly what we were doing this year, how it was different from last year, some experiences we’ve had and what we hope to achieve. After an exhausting but exciting day, we finally got the buggy back to the team room and were just sitting down to figure out what needed to be done next… when we realized it was 5:50 p.m. and our CTV news story was being aired in 10 minutes on the 6 o’clock news! We ran down to the university pub, and got there just in time to watch ourselves on TV. Our story also was put on the Internet newscast and was seen across the country all weekend. Talk about awesome publicity! We also finally selected our moonbuggy riders for this year’s race. Taking advantage of the machine shop’s lunch break, tryouts were held Tuesday at noon in our athletic center. We decided on a recumbent bicycle tryout to simulate our buggy’s riding position — turns out riding a recumbent bike is a lot harder than it looks! Though there were no other girls and therefore no need for me to try out, I decided to do it anyway, to see how I ranked with the guys. It ended up being a tie for first place between me and Chris Polowick, who will be our male rider. Time to start the serious training now! 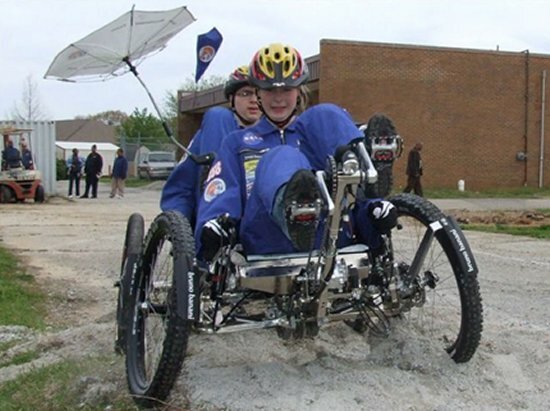 How did you get involved in the Moonbuggy Project? I got involved in the project after Curtis and Brian [Mattock, Curtis’ fellow project manager] appealed to us designers to help them build a better buggy. The project looked interesting, and I love working with my hands, building things. The ability to apply design principles to the project, and being able to manufacture major parts of the buggy, is what sold me. What are your contributions as the token Industrial Design student on the team? I’ve been dealing with the human factors of the moonbuggy. It seemed to me that previous Carleton moonbuggies had been well engineered, but rider, pedal and seating positions had been left as an afterthought. Research into recumbent bicycles and cycling ergonomics led to the initial positioning of the pedals and seat in relation to the riders. Speaking of seats, they have been my main contribution to the project. 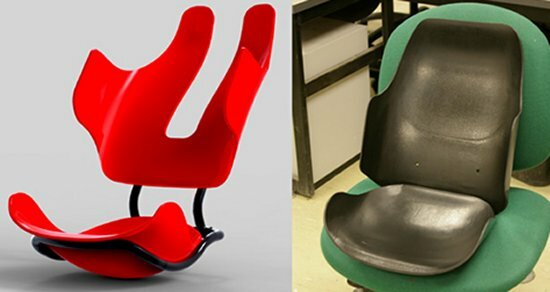 The seats were designed through a series of development sketches and then refined and modeled in SolidWorks 2008. They are made of a folding aluminum frame with vacuum-formed ABS plastic bottom and back panels. After a few tweaks, the seats are quite comfortable and definitely spice up the look of our moonbuggy. What have you enjoyed most about the experience? I’ve enjoyed working with all the engineers involved in the project. I normally work with other designers, and its been nice to work with some more technically minded people. I’m looking forward to representing Carleton’s School of Industrial Design, as well as being one of the few industrial designers at NASA’s Great Moonbuggy Race. 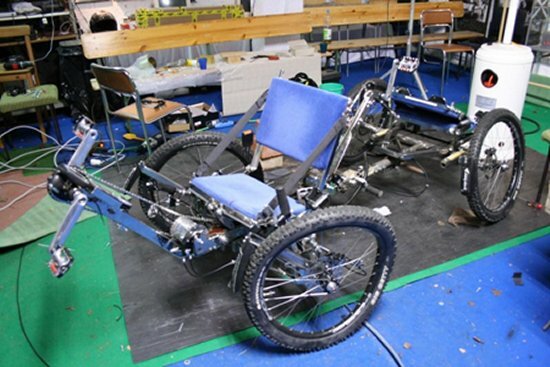 Ralf Heckel’s got an update on technical work being concluded on the German moonbuggy. His team is preparing to depart for the United States at the end of this week. Race time is nearly upon us! Our new, self-designed differential gear finished its first long-term test. There was normal abrasion after fabrication; a surprise was the abrasion of the brass — the carbon fiber pieces scraped at the brass rings. They are smaller after the 24-hour-test (1,5/100 mm). We bonded them together with two-component glue, and now the four small pinions work perfectly without abrasion. Our electronics department is a disaster. Our student specialist leader is ill, so all the other students must make his work too. But it works! All components are working: data-logger, radiotelemetry, short message display, sensors. Now we assemble all together in our Telebuggy computer case. Tomorrow, our students must make a difficult cable tree with lots of data lines. One is a multiple clip located between the Telebuggy computer and the Moonbuggy. Such a clip [interrupted] a space shuttle launch last year. So it must be very secure. 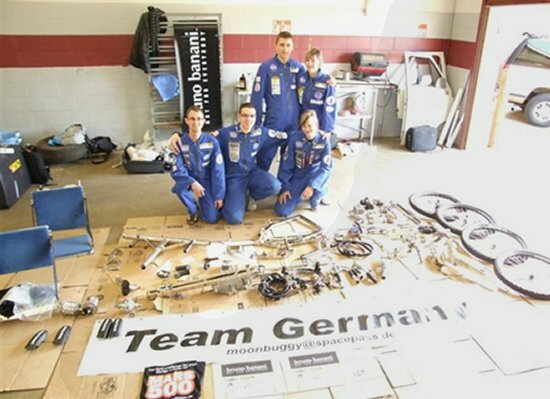 Primary work is complete on the German team’s 2009 moonbuggy. On March 24, our partner team and their professors from the Moscow Aviation Institute visited us. All liked to ride the moonbuggy. All want to be a part of our Russian team for 2010. The summer school for this team starts in summer 2009 in Leipzig. Also, we got an invitation to visit “the Krim” (Crimea) on the Black Sea. There is an international aerospace conference there for students — we should present the moonbuggy there. Near this place, former Russian rocket chief designer Sergei Korolyov tested his first self-constructed plane. Heckel and the moonbuggy team also visited recently with Germany’s next generation of Olympic hopefuls at the “High School for Sports” in Leipzig. Check it out at http://www.sportgymnasium-leipzig.de/. This is Germany’s “elite school of sports” — the most successful school for training of the national Olympics teams’ future generations. 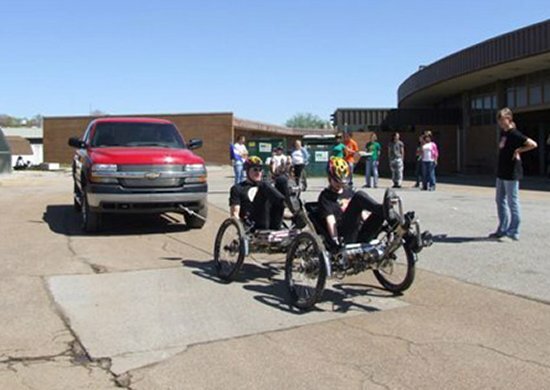 Students of athletics and bicycle sports were testing the moonbuggy. This was a complete new experience for all — it was fun and was the ignition for a lot of discussions. The event was organized by the science advisor at the school and by the German Space Education Institute. 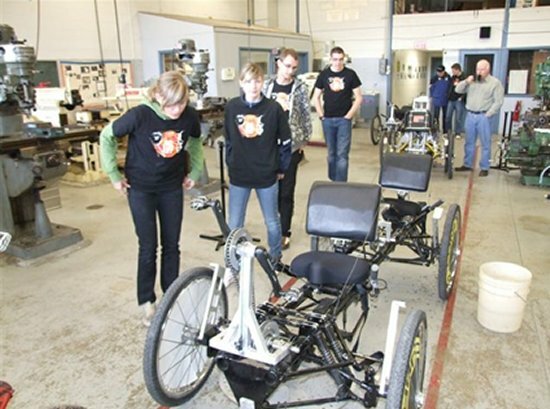 The science results of the moonbuggy team are an inspiration for the sport students. Now they are ambassadors for the moonbuggy spirit at the next Olympic games. 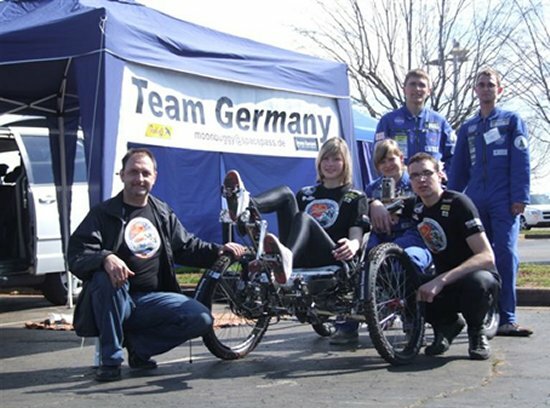 Glad to see Germany’s moonbuggy team making such an international impact, and we look forward to the Russian team’s entry in 2010! Certainly, the Germans are putting together a formidable entry in pursuit of this year’s new “Best International Team Race Time” award, one of numerous prizes NASA and its corporate sponsors will present to participants in the 2009 Great Moonbuggy Race. Will YOUR team take home a prize? We’ll find out in a few short days! Let me tell you a little about HCT. We are part of the Huntsville, Ala., city school system. Our school opened with the 1967-1968 school year. Presently we have 16 teachers teaching 14 different courses or skill areas. 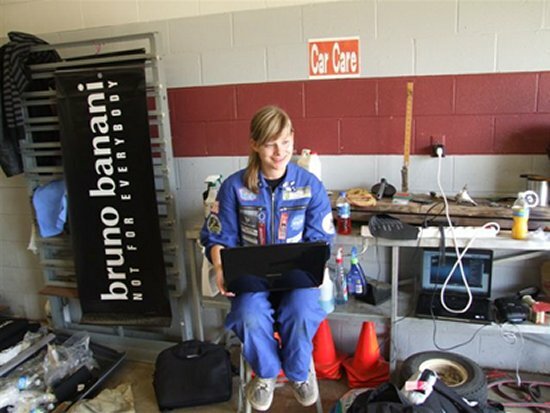 We love technology and get involved, as a school, in numerous projects like NASA’s Great Moonbuggy Race, the “HUNCH” project — High School Students United with NASA to Create Hardware — and our latest project, designing and building a hovercraft. As far as the moonbuggy team is concerned, the true “team honcho” is Mr. White, the Precision Machine Technology instructor. Mr. White takes students from all the other HCT classes, trains them and develops them into a racing team. The building of the moonbuggies is a school-wide project, but all aspects of the design and build come under Mr. White’s supervision. My students and I assist Mr. White with the blog and any computer-related tasks. It is true that HCT has had several amazing racing teams and moonbuggies over the past several years. It is also true that we have worked very hard as a school to accomplish these wins. If Mr. White needs help, or a technical skill not found in the machine shop, he knows he can call on any class, instructor or individual within our school and he will get 100 percent effort. 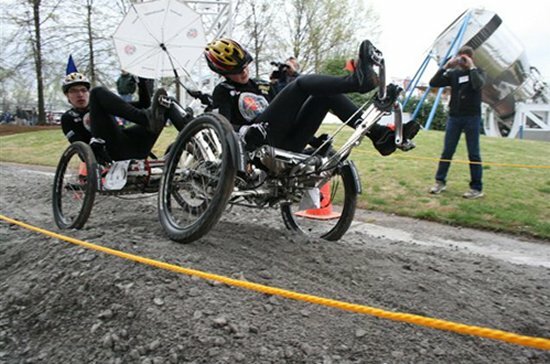 If you’ve been around the Great Moonbuggy Race, you know the competition is getting more and more intense. The difference between placing and not placing is seconds. As a result, you must have your racing and design skills highly tuned. That first moonbuggy lasted about three-fourths of the way through the first heat, if that. I must tell you, however — the team carried it to the finish line. We were so wrong about the design of the buggy… but right about the heart of the team. 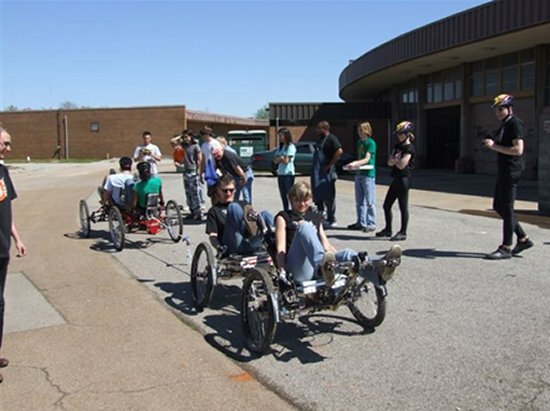 So get your team and moonbuggy together and come and compete! 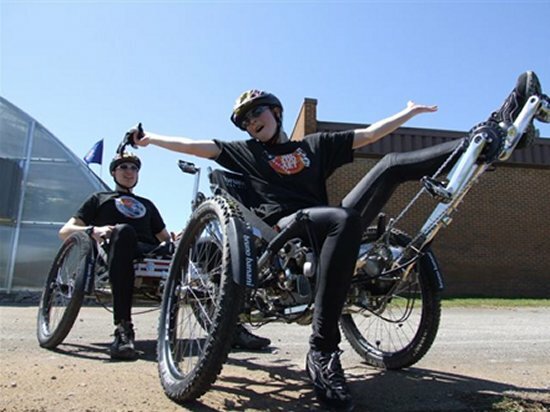 Mr. Stingel will be back next week with a spotlight on HCT’s moonbuggy team members and their thoughts on the race.